The dream of owning a classic Georgian country house complete with stables and sweeping drive keeps countless city workers at their desks. 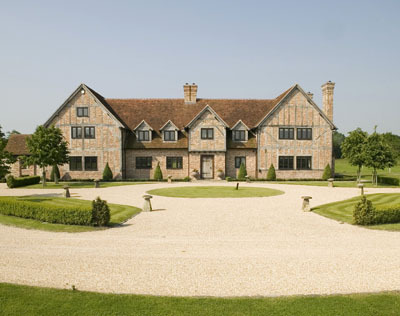 The converted farm or thatched long-house will not do: Palladian proportions, cornicing and parkland are paramount. But the simple truth is there are not enough Georgian country houses to go round. ‘The Georgians didn’t really build that many,’ explained David Milligan from property developer Prestige Properties. Which is why, armed with their city bonuses, increasing numbers of buyers are venturing into the country to find a new country house. ‘We have seen a demand in ‘new’ country houses (£2m plus), rather than traditional ‘period’ properties,’ said a spokesperson for Hamptons International. ‘From a statistical perspective, we could probably say approximately 20% of country house buyers are interested in ‘new’ build today.’ Georgian style buildings are the most coveted but Arts and Crafts, Tudor and modern designs are also popular. 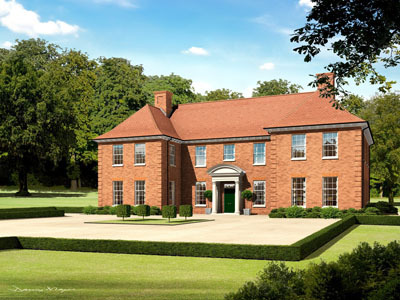 Even Prince Charles has embraced the trend and commissioned architect Craig Hamilton to design an eco-friendly six bedroom ‘starter palace’ for Prince William in the Harewood Park Estate near Ross-on-Wye. Price wise, a buyer will usually get more space for their money with a new country house than with a period alternative, according to Hamptons. ‘The price differential between new for old and like for like would be around 25% and more the further up the price range you go,’ said the spokesperson. The environmental benefits of new build properties are also swaying buyers. 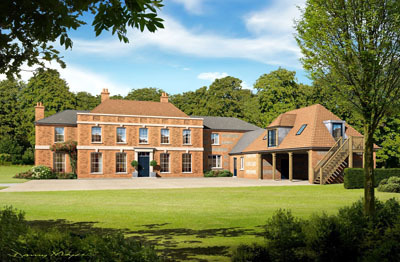 ‘Between 40 and 50% of Britain’s buildings are thermally inadequate,’ explains architect Mark Kingsley who specialises in sustainable energy efficient developments, ‘including some of the country’s finest architecture.’ Sustainable energy systems can easily be installed in a new country property including ground source heating (ideal for under floor heating), biomass heating and wind turbines. Although this new breed of country house buyer usually requires less land (between five and 15 acres), finding a plot on which to build is becoming an increasing quandary for developers. ‘I think planning should be more flexible,’ said Mr Chester. ‘Developers have to be really determined to see a planning application through – often people run out of steam.’ Buying an older, unlisted property and knocking it down to build something grander is one option although the expense of buying a property only to destroy it can be a deterrent. But Mr Kingsley and Mr Milligan are convinced that by 2030 Britain’s new wave of country houses will be the sought after Grade II listed properties city workers dream of. And if more people jump on the bandwagon and ensure their property is environmentally sustainable, there will still be an English countryside to live in when this eventually happens. A spectacular family home with galleried reception room, five bedrooms and planning permission for an indoor swimming pool and detached barn. The outer frame of the house and vaulted first floor ceilings were sourced from a 17th Century Suffolk barn, whilst the ground floor ceilings, doors and frames feature 300 year old beams from a French Chateau. The house gained its name from the stunning, antique limestone floors (on the ground floor) which were reclaimed from a Chateau in the Charente region of France. 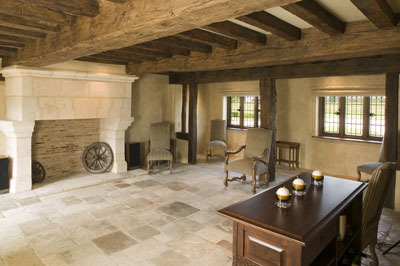 There is a 16h Century French limestone fireplace and traditional French windows. 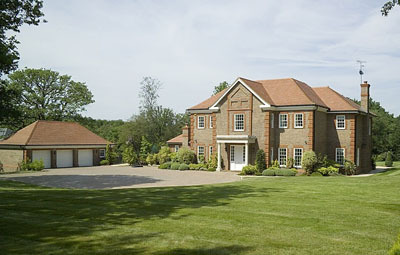 A luxury family house within private park next to the golf course. 5 bedrooms (all en-suite), 5 reception rooms, 2 second floor rooms, kitchen/breakfast room, utility, cloakroom, triple garage, extensive grounds. Given its setting in the heart of the Dartmoor National Park, it is surprising that planning permission was ever granted. 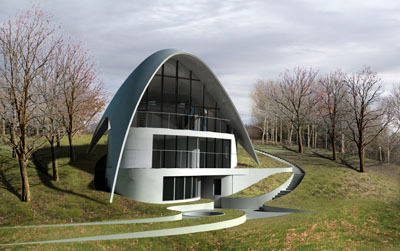 But Andrew Wright’s state-of-the-art design, also known as ‘The Slug’, wowed the authorities. The new 3850 sq ft house is designed to blend seamlessly with the surrounding moorland, giving the sense that it has emerged from the Dartmoor landscape.  3 bedrooms, 2 reception rooms, 8 acres.